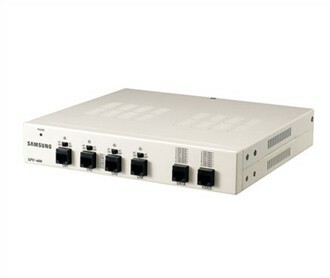 The Samsung SPU-400 is a 4 channel power supply hub that is capable of supplying 28VAC or 24VAC over a long distance on UTP cable. The combination of video from the 4 channels onto a single RJ45 connector for Cat 5 cable and transmition to the Samsung SPU-400R which converts the video back to 4 BNC cables is made posssible. The SPU-400 is equipped with a lightning and surge protector, RS-485 video input support, and automatic fault detection. It consists of different colored indicator lights to show the different stages of the device. The Samsung SPU-400 has many exciting features for users of all types. The Samsung SPU-400 is sold as a Brand New Unopened Item.